AJ Summers Memorial Tower at Seal Beach Pier, Seal Beach, California. As summer winds down a journey west comes to an end south of Los Angeles. When there is no more road to carry forth an adventure, that adventure reaches it's natural conclusion. The shore of the Pacific Ocean at Seal Beach. All a weary traveler can do is walk to the end of a pier, pause, reflect and turn around as a new chapter is about to set sail. 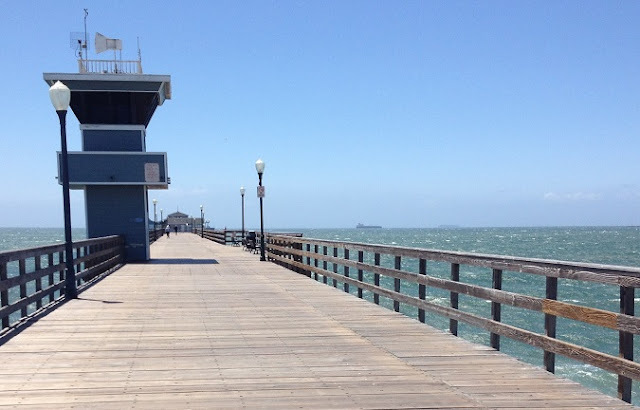 While taking this walk along the pier at Seal Beach and contemplating a new life on the left coast it was comforting to find poetry on the pier. A short poem dedicated to the life of a local lifeguard. A reminder of life's frailty and the inherent natural beauty that surrounds each and every one of us. These words written on a plaque erected five years after the untimely death of AJ Summers recall a local hero, to whom the tower on the pier is named. They remind us of a lifeguard we do not know and of a journey forward that is still unknown.